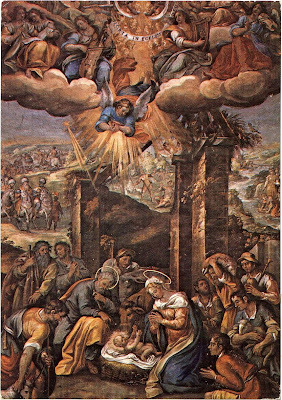 Painting found in the choir at the Angelicum, Rome. Better bundle up - the goose bumps will freeze you!!! I think I need to read this every year at Christmas. After supper was over I took my boots off and stretched out in front of the fireplace and waited for Pa to get down the old Bible. I was still feeling sorry for myself and, to be honest, I wasn't in much of a mood to read Scriptures. But Pa didn't get the Bible, instead he bundled up again and went outside. I couldn't figure it out because we had already done all the chores. I didn't worry about it long though, I was too busy wallowing in self-pity. Soon Pa came back in. It was a cold clear night out and there was ice in his beard. "Come on, Matt," he said. "Bundle up good, it's cold out tonight." I was really upset then. Not only wasn't I getting the rifle for Christmas, now Pa was dragging me out in the cold, and for no earthly reason that I could see. We'd already done all the chores, and I couldn't think of anything else that needed doing, especially not on a night like this. But I knew Pa was not very patient at one dragging one's feet when he'd told them to do something, so I got up and put my boots back on and got my cap, coat, and mittens. Ma gave me a mysterious smile as I opened the door to leave the house. Something was up, but I didn't know what. "I rode by just today," Pa said. "Little Jakey was out digging around in the woodpile trying to find a few chips. They're out of wood, Matt." That was all he said and then he turned and went back into the woodshed for another armload of wood. I followed him. We loaded the sled so high that I began to wonder if the horses would be able to pull it. Finally, Pa called a halt to our loading, then we went to the smoke house and Pa took down a big ham and a side of bacon. He handed them to me and told me to put them in the sled and wait. When he returned he was carrying a sack of flour over his r ight shoulder and a smaller sack of something in his left hand. "What's in the little sack?" I asked. Shoes, they're out of shoes. Little Jakey just had gunny sacks wrapped around his feet when he was out in the woodpile this morning. I got the children a little candy too. It just wouldn't be Christmas without a little candy." We rode the two miles to Widow Jensen's pretty much in silence. I tried to think through what Pa was doing. We didn't have much by worldly standards. Of course, we did have a big woodpile, though most of what was left now was still in the form of logs that I would have to saw into blocks and split before we could use it. We also had meat and flour, so we could spare that, but I knew we didn't have any money, so why was Pa buying them shoes and candy? Really, why was he doing any of this? Widow Jensen had closer neighbors than us; it shouldn't have been our concern.